I’m not much of a bird watcher, but on my first visit to Costa Rica I kept hearing this strange sound, almost like one bird trying to laugh while another one is whistling. That made me look up, and when I spotted the bird that was making the sound, I started to laugh. I had the distinct impression that it was putting on a show just to entertain the tourists, and it immediately became one of my favorite rain forest animals. The bird is called the Oropendola (often, and understandably, misspelled as “Oropendula”). It’s a largish bird that looks black from a distance but is actually dark brown, with bright yellow tail feathers. There are two species of Oropendola: the Crested Oropendola (Psarocolius decumanus) and the Montezuma Oropendola (Gymnostinops montezuma). Oropendolas are native to Central America, with some found as far north as southern Mexico and some as far south as Ecuador and Brazil. In the parts of Costa Rica I’ve visited, the Montezuma Oropendola is more common. I also have two brief movies of Oropendola in action. I took these by holding my digital camera up to the lens of a telescope, so the quality isn’t the greatest, but you’ll get the general idea. Scientists will tell you this behavior serves a purely utilitarian purpose. When a male displays his tail feathers and makes the distinctive mating call, it attracts females, end of story. (In a typical Oropendola colony, there are five females for every male, so the males keep busy.) Like most scientific explanations, this one is sensible and descriptive—but also dull and unimaginative. Thousands of bird species manage to mate without such an elaborate ritual, even if they don’t have yellow tail feathers. I have an alternative explanation for both the swinging behavior and the call: Oropendolas flip around branches because it’s fun, and the call can be translated directly into English as “Wheeeeeeee!” Watch these birds for a few hours and you’ll probably come to the same conclusion. The name Oropendola is also suggestive of the bird’s unusual nest: a long, narrow woven basket one to two meters in length. Each nest holds just one adult female and her offspring. They hang from the highest branches of tall trees, sometimes in clusters of dozens or even hundreds. As with other rain forest creatures such as sloths and leaf cutter ants, Oropendolas participate in some interesting symbiotic relationships. I’ve read two very different accounts, both involving the cowbird, which does not build its own nest but lays its eggs alongside those of the Oropendola. According to one source, Oropendolas like to nest in trees where hornets are found, because the hornets keep away the cowbirds; Oropendolas, in turn, protect the hornets from bees. Other sources say the cowbirds are a desirable neighbor, and that Oropendolas like hornets because they attack botflies, the real enemy. Botflies like to lay their eggs directly on newly hatched Oropendolas, and the botfly larvae feed on the birds. But cowbird eggs hatch before the Oropendola eggs do, and the young cowbirds feed on the botflies, thus protecting the Oropendola. Oropendolas are not the largest or most colorful birds; most tourists in Central America’s rain forests are really looking for the Resplendent Quetzal, with its absurdly long, bright green tail. 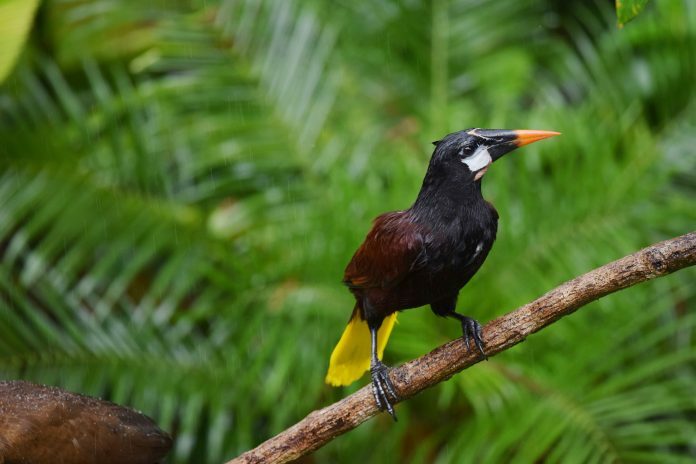 But what the Oropendola lacks in sheer flashiness it makes up for in style. Note: This is an updated version of an article that originally appeared on Interesting Thing of the Day on July 20, 2003, and again in a slightly revised form on November 7, 2004.